When one thinks of Doom Metal, the first band that immediately pops into one’s mind nine times out of ten is Black Sabbath. The second is Candlemass. In 1984, when Motley Crue was still touring for Shout at the Devil and Metallica released Ride the Lightning, Candlemass entered the scene with their own unique hunger: to create music developed from minor keys and massive riffs both fast and slow, without gimmicks. Epicus Doomicus Metallicus and Nightfall rank directly beneath Master of Reality and Sabotage (personal favorite Black Sabbath albums) as absolute masterpieces in the genre as they not only followed in the footsteps of Iommi, Geezer, and company, but also trail blazed their own journey creating a truly masterful legacy. Out now is the latest offering from Candlemass, a four-track sampling of new material, a taste of what is to come soon, House of Doom. With this material, one cannot help but feel the buzz of excitement for what is to come, hopefully, sooner than later, though the band has rightfully earned their own room for exploration, no longer having to meet strict deadlines thanks to their long history and hard work. The title track is the perfect selection to open up the release for it contains all of the elements the band is known for yet still sounds new and relevant. A massively heavy riff alongside double bass is featured in the beginning and are followed by a huge, catchy chorus that edges itself into one’s brain where it resides for long after. The interlude is minor key magic with Hammond organ work that excels in not only adding atmosphere but technical mastery with its nod to both J.S. Bach and Edvard Grieg. The second track, “Flowers of Deception” is a much faster-paced affair initially with a chorus made of a riff that sounds like the love child of Tony Iommi and Kirk Windstein from Crowbar. In the middle is a plodding, minor key romp leading into a different iteration of the chorus, and the solo that follows begins with a deep plunge, a descent into the lake of fire for inspiration for the stabbing runs that follow only to resolve into a finely-crafted melodic minor riff. Mats Levén has a tenor voice that contains the perfect balance between soul and aggression to successfully deliver the music’s intended lyrical message. He truly shines on the third track, an acoustic ballad called “Fortuneteller” with vocals that are reminiscent of Zak Stevens from Savatage. Bassist Leif Edling and drummer Jan Lindh are tightly locked in as the latter performs hard-hitting, impactful time-keeping and Leif’s bass, a little dirty and the precise executor of the bottom-end, roars as it flirts with both locking in with the drums and meandering into its own melodic territory, knowing when to follow the guitar and when to shine. The review would be amiss if the guitar tone were not mentioned. Mats “Mappe” Björkman’s rhythm playing and Lars “Lasse” Johansson’s lead work are constructed of the kind of tone that many, many guitar players spend thousands upon thousands of dollars and lifetimes to emulate. It’s a tone of gargantuan girth and precise attack, a sublime definition of every note in every chord every time. Every nuance, bend, trill is wondrously translated to the aural spectrum as the tone comes second from the gear and primarily from the hands. The use of Hammond organ gives the material a level of polish not seen in other similar bands as the material delivered is instantly classic, taking notes from the mighty Deep Purple. If Black Sabbath is the messiah of Doom Metal then Candlemass is the St. Paul, propagating the gospel around the world for all to hear. For Heavy Metal itself to be in its fifth decade, it is more than gloriously sublime that a sound so pure and defined yet tailored from the original thread can still be achieved on record. Candlemass should be required listening material for all budding disciples of our beloved music. Few bands if any are able to draw from the original well of creativity as such and still deliver credible material that is both relevant and revolutionary without sounding like a parody of themselves. 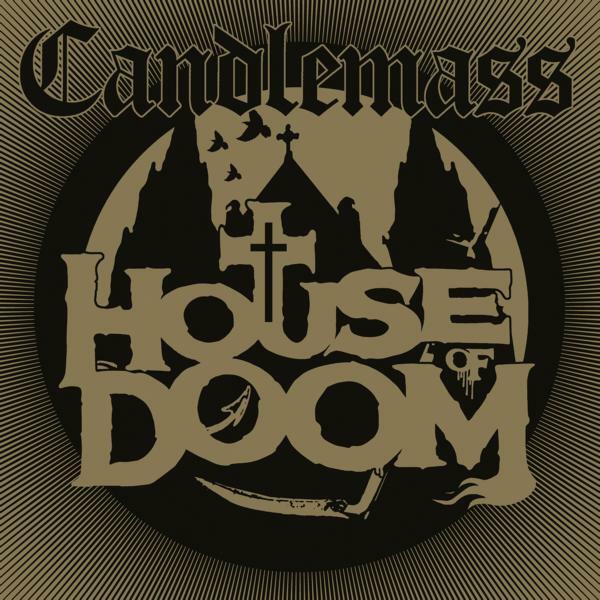 The masses are waiting with baited breath for the next release of Candlemass, and though House of Doom is only four tracks, it is certainly a blessing for the meantime.